Last semester I took an online class in public speaking. (I had to make a bunch of videos - it wasn't pretty.) For my last speech I had to choose from a list of character traits and values. I chose creativity because it's something that fascinates me, mostly because I have to keep convincing myself that it's something I possess despite my lack of demonstrable artistic ability. In my speech I made the claim that A) Everyone is creative and B) Creativity is important for everyone, including accountants and C) You can increase your creativity with a few simple tips. The funny thing is that I knew that's what I believed long before I did a lick of research. When I did my research it turned out that I was 100% right, not something I get to say very often. Turns out that this book said much the same thing but with more words. 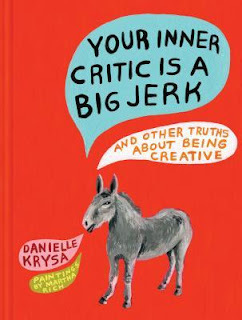 The major takeaway from this book is that you are creative and you better stop saying you're not. Thanks, Danielle, for backing me up because that's exactly what I said! She has some great ideas for taming your inner critic and finding time and room to nurture your creative side. It's a book I'd like to return to once in a while to remind myself that I deserve to be creative and I don't need to be a great painter like my mom or a genius like my dad to qualify for my creativity badge. If I have one complaint about the book is its focus on the arts, especially visual mediums. Not all art is creative and not all creativity is art. You can be a creative ditch digger or CEO and you can be an uncreative painter. Creativity is a trait separate from its outlet. Some accountants are more creative than some musicians, and not always in a bad way. I lean heavily on creativity in my programming and database development. The author does mention once or twice that creativity isn't just about art and writing, but most of her examples came back to those, probably because that's where she excels. It's not her fault that some of us are more creative in Excel than we are with paint. It's a good book, much better than my speech, and I recommend it. Four rainbow glitter stars.